We keep looking for evidence that policy changes coming out of Washington—namely tax cuts and deregulation—are stimulating entrepreneurship and so far we’re coming up empty. The latest evidence comes for the BLS’s Business Employment Dynamics (BED) series. The BED series isn’t the timeliest around—we just got the data for the first quarter. But we shouldn’t get too hung up on novelty; these things have long-term effects. 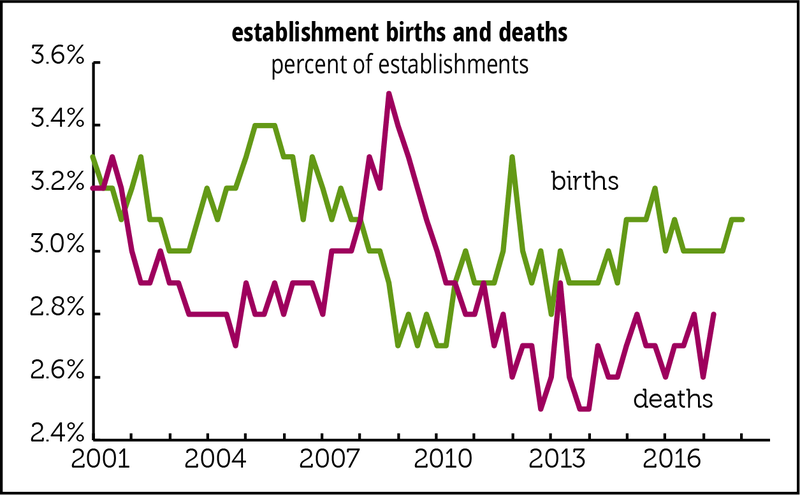 Establishment births, expressed as a percentage of total establishments, were unchanged between 2017Q4 and 2018Q1, at 3.1%. (Establishment deaths, which are available with an additional three quarter lag—you want to make sure they’re really dead and not just unresponsive—rose between 2017Q1 and 2017Q2.) That 3.1% birth rate is below earlier peaks in 2005, 2012, and 2015 (each of which was lower than the previous). Maybe things will pick up, but they haven’t yet. but we didn’t want to take it apart. That has not happened. While Independents tend to track all households, the outlook among Democrats and Republicans has instead widened slightly since Trump took office, as the outlook has risen 4 points among Democrats, and close to 7 among Republicans. Small beer, perhaps, but against Dr. Curtin’s expectations. In 2008–2009, all agreed that the outlook was grim, with sentiment among Democrats and Republicans hitting lows, and series lows, of 31 in June 2008 among Democrats, and 48 in March of 2009 among Republicans. Both parties also had low levels in June 1980, and both parties ended 2008 at 59. And it’s all on the exuberant side of the scale. Both parties have a floor around fifty, but the Republicans top out at 124, almost 20 points higher than the Democrat’s 106. In the surveys taken during the Reagan and GW Bush years, Republican sentiment averaged 20 points above that of Democrats, if you exclude the 3.9 and 0 for November and December 2008 after Obama’s election, that is. During the Reagan years Republican sentiment averaged 108, Democratic, 88, and during the HW Bush years Republican sentiment ran at 80, and Democratic at 64. In those polls taken while Obama was President the Republicans averaged 19 points below the Democrats, but averaged just 9 points below during the recession years of greater agreement. (So as the expansion took hold, the split widened.) Whoever thought we’d remember anything comforting about those two years? During the years Obama was president, Democratic sentiment averaged 87, and 93 if you take out the recession years. During those same years Republican sentiment averaged 69, and 72 if you take out the recession years. During the years Trump has been President, Republican sentiment has averaged 117.6; while that of Democrats averaged 80, meaning Republican sentiment is running 46 points above the Obama years, while sentiment among Democrats is running just 13 points below (both calculations exclude the recession years). Democratic sentiment is running near where it has in prior Republican administrations, while Republican sentiment is off the chart. It’s no surprise that consumers feel more confident when the White House is occupied by people whose policies they tend to support. But currently, the Republican outlook, which peaks above the Democratic outlook, is in the cat bird’s seat, while the Democrats are more restrained on the downside. (Dr. Curtin noted that all of April’s gains were driven by Democrats and Independents.) It’s not illogical to wonder if the survey is becoming biased to the upside during this Republican administration, given these differences in character. The gap is even greater for the expectations component of the index. Dr. Curtin points out in September 2017 comments that over the then-last seven months, Republican expectations exceeded the series peaks for all households, while Democratic sentiment was about level with the start of the recessions of the last half-century. In October 2016, the Republican outlook was 61 while the Democratic outlook was 95. As you can see where blue fades to light red on the right of the lower chart, by February 2017 the Republican outlook had doubled, to 120, while the Democratic outlook fell to 56, rocketing the gap between the two by close to 100 points, from -34 to +65. That unprecedented disparity narrowed only to 48 in September, and has since widened to 55, considerably larger than the gap for current conditions. During the final months of the Obama administration, a gap also widened, but it averaged 22 points for the 5 months, and only extended to 34 points. A striking point Curtin makes: the demographics really changed in 2017. Through 2016, generally, assessments of economic possibilities rose with income and education, and fell with age. That changed in 2017. Overall expectations for those with less than a high school degree had risen from 68 in October 2016 to 82 by August 2017, but fell for those with a college degree from 87 to 80. For those 65+ they rose from 2016’s 69 to 83 in 2017, while slipping a bit, to 86, for those 18 to 34 years old. Sentiment for all three education terciles tracked each other closely throughout the series, all peaking around 2000, high school at 100 and the two college groups at 120, before falling raggedly to about 60 in the recession. The current divergence is led by an increase in the outlooks of the two lower attainment levels while those with a college degree are basically flat. Since 1978, the gap between those with a college degree and those with some college has averaged 4.8. It has widened over time, and varies a lot. It’s averaged -0.4 since January 2017, and is currently -1.4. The gap between those with a college degree and those with high school or less has averaged 12, and had never been below the water line through 2016. It did slip to 1% in February 2009, maybe there’s something about the aftermath of an inauguration, but recovered to the average and even spiked into the 20s in early 2013, a record high, although it hit 20 in early 1985. In October 2016 the gap was 14 points, slipped to 6 in January, and then ran slightly negative for 3 months. It has now recovered to 4.2, and has averaged 3 since January 2017. This is a tricky issue. We want people to get the education they need to have job and economic security, and we doubt that less than high school fills the ticket, but people with low educational attainment shouldn’t be punished, and we want them to do well. Still, such a shift is unsettling. It really is a drag that we don’t have a full series. Maybe one of the subgroups, perhaps those with some college in the north central region? always gets it right. We’ll never know. They work to shift the focus from the effects of international trade on different groups of workers to different groups of consumers, and want to know if changes in prices driven by increased international integration exacerbate or ameliorate real income inequality, driven by nominal income changes. The authors reference a 2016 paper, “Measuring the Unequal Gains from Trade,” in which Pablo D. Fajgelbaum & Amit K. Khandelwal (of UCLA and Columbia) review the effects of import price disparity on high- and low-income consumers. Their scenario involves closing down trade, which is extreme and we don’t expect, but their work is still worth a look. Using the elasticity of imports, incorporating both trade costs and income, they find that such a closing off of trade would be about twice as hard on lower income groups than on the top decile: lower-income consumers spend more on traded goods, with lower elasticities, whereas higher income groups spend more on services. This bias extends around the world, but in countries with lower elasticity of exports, fewer gains would accrue to the poor from opening trade. Hoffman and Monarch find that low- and high-income groups have about the same share of expenditures on imports, and both have increased to about 10% as of 2014 from around 7% in 1998. However, the 1st decile’s share of imports excluding food and fuel is about 70%. That share falls to about 66% for the second decile, and then rises through the deciles to 77% for the top. But all goods are not equal. Those much disparaged washing machines are about 1.8% of expenditures for the lowest decile, steadily falling to just 0.8% for the highest, whereas spending on imported sporting goods rises from about 0.5% for the lowest to 2.2% for the highest decile. We can see where this is going. Although inflation in imported goods has risen for all groups, the lower income groups have faced higher inflation in import prices. Using prices for 228 Harmonized Commodity Description and Coding System sectors—let’s stick with HS—the authors find statistically significant differences in price changes across income groups. 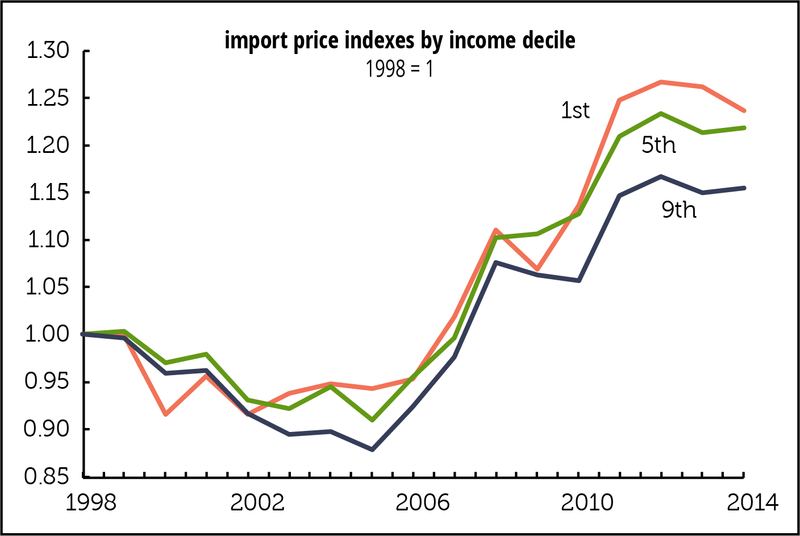 As the graph on p. 2 shows, import inflation was up 24% for the first decile, and 15% for the ninth. And China held yearly changes in import inflation down for all deciles. Without China, yearly import inflation would have been up an additional 0.5–0.6 percentage points. Since the method used to produce the results allows the authors to see different expenditure shares of the deciles within the same sector, and different expenditure shares across product varieties, the authors were able to demonstrate that taking out cross-sector differences aligns yearly increases for all deciles at 1%. That indicates to the authors that high-income consumers gravitated to sectors with lower inflation, and leads them to conclude that nominal income inequality that has risen owing to trade in the last decades, was not mitigated by changes in import prices across income groups. This is pretty specific information, but it underscores how much more specific the debate should be. Many of you already have the heart-breaking news that the wonderful Richard Yamarone stopped breathing yesterday afternoon; he had a heart attack on Thursday morning while playing hockey with his team, his Thanksgiving tradition. In 2009, Captain Chesley Sullenberger safely landed his crippled plane on the Hudson River. So accomplished was he that he planned to hit the river where he thought there would be no boats, telling passengers to, “Prepare for a hard landing.” I remember thinking at the time it would have been admirable if the monetary officials could have been so blunt in 2007. 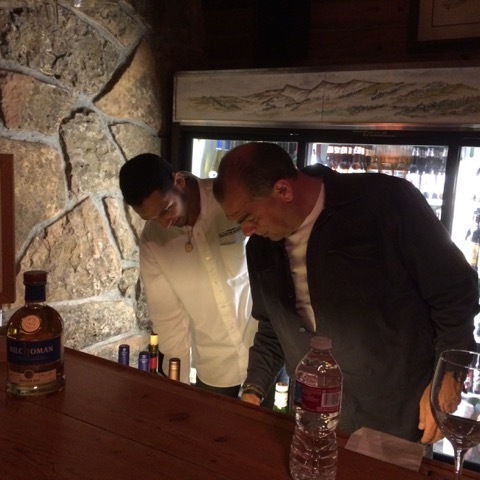 A tremendous man, a tremendous friend, and a tremendous economist, the real kind. And he had a burly Welsh heart. Also a pilot, Rich too would have thought about the boats on the river. And don’t miss him singing and playing. Last night I dreamed that a mighty redwood fell in the forest.